At 1 a.m. this morning, my roommate Marie and I found ourselves unable to sleep. We thought we might be too hot so we opened a window or too hungry so we got out some snacks. I proposed an idea that we streak around the building, envisioning two naked girls running wild through the parking lot, with all the guys sound asleep and oblivious. I don't know which was funnier, thinking about it or doing it because we didn't do it. Sorry to disappoint! After breakfast at a little bakery cafe that Chris parked himself in front of and that did indeed have the very best muffins, it was time to get to the task of cleaning our bikes. But this was nothing like when I clean mine at home, in my dining room, with Bike Lust and a rag and lube. No, Kent had set up a veritable bike spa with four stations that would clean every area of the bike and leave it looking shiny and new and ready for more abuse. Now it was our turn to treat ourselves and a bunch of us (Tom S, Kent, Bill, Marie, Marilyn and I) set out for the Nakusp Hotsprings. They were of the tame variety and more like a swimming pool than a hot-spring but it didn't require a hike on our sore legs and there were chairs out in the sun. The chairs were not too comfortable to nap on, but I gave it a good try anyway. It was at least nice to go somewhere that didn't require us to turn pedals, as we went in Tom's van. 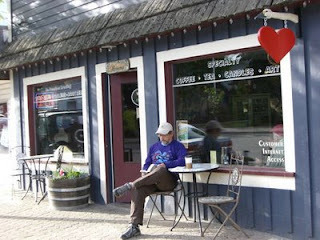 After returning to town, I made the discovery that the bakery sold pie by the slice. I convinced them to sell me the whole pie since it was late in the day and I promised to return the pie dish. It was at first intended to be for dessert that night (to share) but I was too full and instead purchased containers to put it into so I could be assured of keeping up my pie intake for the next few days. The evening brought rain and I went down to the lake to read and took shelter in the Japanese Garden. 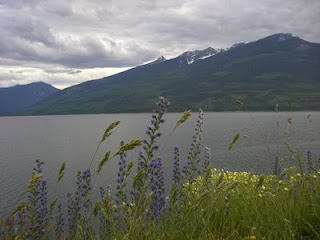 The town of Nakusp has some beautiful features for being such a small community. 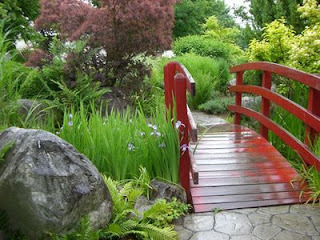 There is a lakefront walkway with gardens all along the way, including a Japanese Garden. There is a sandy beach with a volleyball court and also a skate park to give those young rascals something to do with themselves. After walking around town a few times, it was as though I had already become a local; I saw familiar faces who waved and smiled at me. What a great place to spend a rest day.